The Choice addresses a critical yet unexamined presupposition related to ministry today – defining success. Hoag, Rodin and Willmer identify the current situation, suggest how we got here, and outline practical, formational insights for life and leadership. The principles embedded in this book provide a Christ-centered path for pursuing kingdom outcomes. The Choice presents a clear, biblically-grounded framework that challenges and encourages us as believers to focus our calling and lives on kingdom outcomes that make an eternal difference, and to deal head on with the lies of the enemy who tempts us today. All who make the choice to demonstrate that Jesus is in control, Jesus is whom we serve, and Jesus is our core identity will rock this world and bring glory to God. The Choice is powerful, purposeful, intentional, pragmatic, and can be a resource to every kingdom leader and their leadership teams and boards. I look forward to a deliberate engagement with my leadership team! We want to impact the entire world for Jesus. So surely that which is bigger, involves more people and accomplishes more ministry is always better, right? Hoag, Rodin and Willmer open the Bible and show us what true kingdom principles actually are, guiding both ministry leader and fund-raiser through the maze of competing voices in our world today, including our Christian world. If you want to understand true kingdom stewardship, this little gem of a book is essential reading. You will find yourself in this book. And unknowingly, you are walking one of two paths. Whether you are sitting in the pew, preaching in the pulpit, practicing spiritual formation, or providing leadership for some missional community, you need this book to keep you on the kingdom path! Hoag, Rodin and Willmer understand the gospel pattern: daily faithfulness will lead to divine fruitfulness—a fruitfulness defined by righteousness, compassion and peace rather than by numbers, appearances and attractiveness. This book is a clarion call for every believer to return from the worldly path of control, idolatry and pride to the Kingdom path of humility, love and stewardship in his or her life and ministry. I was especially impressed with its stress upon radical generosity. I highly recommend this book to every Christian eager to follow Jesus faithfully in this age of crisis when mammonism and prosperity gospel are overwhelmingly prevalent and penetrating even into the church and numerous parachurch ministries. This is a must read! I recommend that every ministry and ministry network works through The Choice to determine whether they follow the kingdom path. The excellent study guide and practical resources will help facilitate discussion within team meetings but also during global ministry network gatherings. I hope that this book will become a platform for determining success in all areas of ministry and become essential reading in theological institutions around the world. With all the Christian formulas of leadership that simply mimic popular models and smatter them with some Bible, you'll find in The Choice a refreshingly different take. Here's a book that starts with the Book and draws the reader into what Christ-centered ministry and leadership should look like. Gary Hoag, Scott Rodin and Wes Willmer have written an essential resource – a stewardship kit – for every pastor and ministry leader who is tired of ‘doing it themselves to death.’ The Choice is a clear, concise, practical and applicable manual that demonstrates how to create development strategies that focus on faithfulness and results focused on eternity. The Choice is a clarion call to forsake the common, natural tendency to do ministry in our own strength, power and initiative and to embrace Christ’s heart of ministry to others. John Wesley, states "a fanatic is one who seeks desired ends while ignoring the constituted means to reach those ends. "… I am convicted at how easily I ignore "Christ’s constituted means" for growing His church. Thanks for the timely word and for calling me to what really matters. 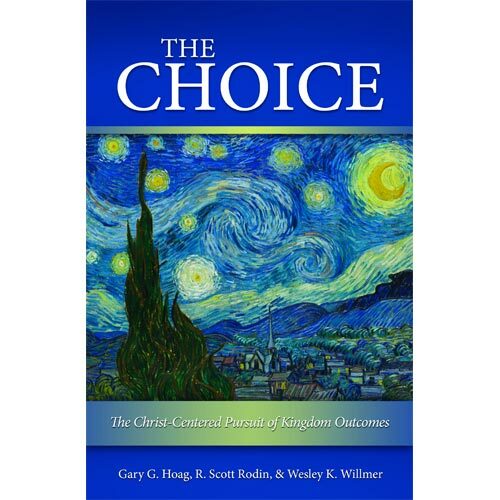 The authors of The Choice challenge ministry leaders and board members to rethink approaches, motivations, planning processes, and assessment outcomes in light of kingdom understandings of leadership and stewardship. In this well-conceived, reader-friendly, insightful, and highly applicable work, Hoag, Rodin, and Willmer chart the course for churches and parachurch ministries, as well as institutions and organizations, to once again refocus all activities and strategies in accordance with biblical faithfulness. I was certainly helped by this book and I trust numerous others will be as well. When it comes to running our churches and ministries, it requires a consuming adoration for the Savior not to become seduced by the ways of our culture. The Choice helps us turn away from those siren calls that can drown out the Spirit’s guiding whispers, “This is what Jesus meant; here is the kingdom path; just walk in it. This book is so timely for today’s Christian leaders – I highly recommend it! A remarkable book that will unleash those pursuing a Christ-centered life for maximum Kingdom impact. By exploring and following practical formational practices of Christ’s ministry revealed by the authors, a life of fruitfulness will be your legacy. Over the years in Christian camping ministry, I have often felt the pressure to perform and achieve success based on a secular, production-driven model. Gary, Scott, and Wes bring another option – a renewed and profound thinking guided by Scripture and God’s leading. The Choice is a must read by everyone in leadership; best done as you sit before God, listen for His guidance, and humbly submit to His direction. We have often felt suffocated by the outcomes, metrics, and results demanded from us as leaders. Many times we have wondered, “Is this what means to lead a Christian ministry?” While reading The Choice, we felt like the two men walking to Emmaus with Jesus explaining everything to us through the Scriptures. After reading it we said: were not our hearts burning with us while on the road (of leadership)? We knew it! There is a Christian way and you too can find it in The Choice! We urge to translate this book to other languages. The Choice is the rare book that combines prophetic witness and practical ministry application with clarity and spiritual depth. Hoag, Rodin and Willmer have crafted a manifesto for Christ-centered ministry. This book is an ideal resource for leaders and boards grappling with faithful service in a production-oriented culture. Hoag, Rodin, and Willmer make a vital case for achieving mission in a way that honors how God designed us as leaders. Results in ministry, while seemingly fundamental to our calling, are sacred evidence of God’s work rather than a badge of honor and credibility for ourselves. The Choice provides us with a clear and tactical path to surrender control over our ministries and pursue a leadership character which redefines sustainability as ‘maintaining a posture of dependence on the Father’. I’m privileged to recommend this book and accompanying study guide with high esteem. Hoag, Rodin, and Willmer are to be commended for their work in this book. It calls us to recognize the ways in which we have put our mission before God’s mission and therefore created leadership models focused on personal rather than kingdom outcomes. All who read this book will be challenged to examine the way they lead, edified by the practical and formational processes outlined herein, and encouraged by the reality that God reigns! Whether leading churches or planting new churches, The Choice is an essential tool to give you focus doing kingdom work in kingdom ways. I can't wait to communicate the time-honored, kingdom-oriented, joy-filled, Holy Spirit guided way of doing life together with those in the Anglican Mission and my local church. This book carefully articulates kingdom values God has sewn in my heart and life. Read, learn, mark and inwardly digest everything in this book. Worldliness can take all sorts of forms, even in Christian ministry, and in this book Hoag, Rodin and Willmer challenge us to make a choice to turn from the assumptions that the world presses upon us and to embrace a better way—the way of Jesus and His Kingdom. Anyone involved in Christian leadership will profit from this reminder that you can gain the whole world but forfeit you soul. Jesus was, and still is, the ultimate leader! Jesus exemplified the leader as a Shepherd, a Servant and a Steward. Hoag, Rodin, and Willmer give us a wonderful picture of a Steward Leader. Each gentleman has spent a lifetime of making application of the contents in this book. This is not theory to them but the sharing of a lifetime of experiences. Scott, Gary and Wes, thank you so much for this contribution to any leader's tool box! The Choice belongs on the reading list of every Christian leader. 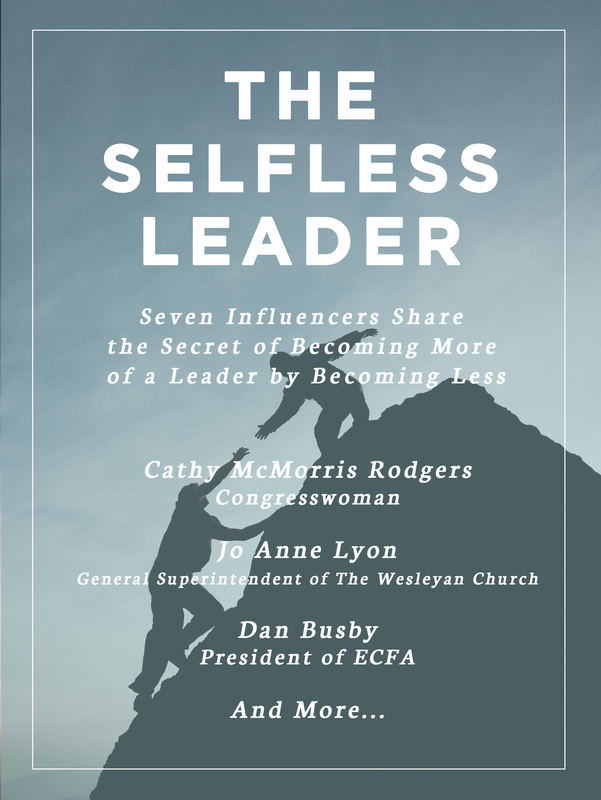 It may be the most liberating leadership book I’ve ever read, because it frees us from the chains of earthly measurement and challenges us to examine how God measures the success of our endeavors – and how we should, too. Perhaps best of all, I have the privilege of knowing the authors personally, and I can testify that these are no armchair theologians. They have tested these lessons in their lives and work. Scripture provides guidelines and principles by which we can experience a break out of God's Kingdom in our individual, church and ministry lives. The Choice does an excellent job of identifying what Christ-centered success and leadership looks like and offers some practical steps on how to make changes in our personal and professional lives, to better align with Scripture. The Choice is a watershed book on leadership. Not the “run of the mill” leadership but one that clearly defines as well as models, leading from a Kingdom perspective. This is radical leadership desperately needed for the second decade of 21st Century. All three of these authors with PhD’s are known nationally and even internationally as thought leaders in the areas of leadership, governance, New Testament, theology, and generosity as they speak, write and publish individually. Anytime the three combine their efforts and expertise, I recommend paying attention to the practical wisdom that results. Reading a book by Gary Hoag and Scott Rodin is to know that some of my paradigms will be challenged. 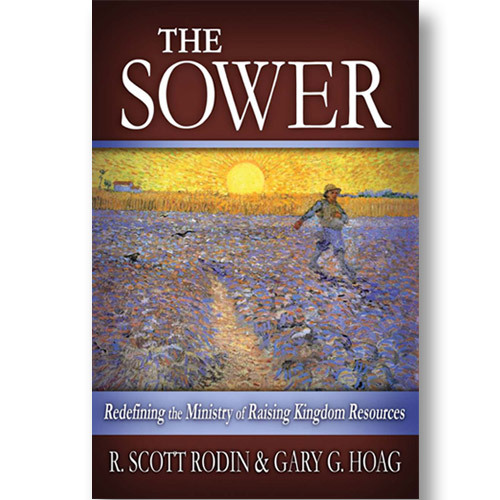 In their book, The Sower, my view of fundraising activities were challenged and reordered. Now joined by Wesley Willmer they are at it again in The Choice, causing me to reexamine our goals and measurement of success and daring me to take a path toward kingdom outcomes, not those prescribed by the world. Sometimes culture has a more powerful sway over us as leaders than we'd like to admit. The prevailing styles of leadership can lead us toward an unhealthy focus on numbers and buildings instead of kingdom-oriented values. Gary Hoag, Scott Rodin, and Wes Willmer help us set our compass back to the kind of leadership that God requires, based on profound, time-tested principles anchored in the Kingdom of God. I just about used an entire highlighter. The book starts strong, with excellent observations that distinguish between the world's view of success and what the Bible and the life of Christ have to say. Then, it gets stronger with so many profound questions and practical ways to move toward the viewpoint of Scripture. Honestly, this book describes the way I know I should lead and the way that I want to lead, but too often don't lead. However, I didn't feel like the book was beating me up, I felt like it was lifting me up and encouraging me to press on, seek true success and lead well. I so concur with the book's viewpoint that unexamined presuppositions drive everything we, as leaders do. The myriad of voices in our culture drive us to almost instinctively measure success by 'more' instead of by flourishing biblically. The ten marks of Christ-centered ministry are clear, practical and convicting. This isn't a book that I will just read; it is a book that I can use to help me be a more Christ-centered leader.